EZRentOut enables you to effectively manage Point of Sale in your shop by making the ordering process faster. When you add an order, it is populated by default values (see Settings) and you can click anywhere to change them. For charging payments, you can use our Credit Card Swipe or PayPal integration. – Simply select a few of them from the items list and add to order in mass. – Use EZRentOut’s mobile app to bulk scan QR Codes/Barcodes and add to order (or take more actions). – Use Order Page to add items do a rent out or sale. In this post, we’ll guide you through the process of using a Barcode scanner with EZRentOut. You can plug in a barcode scanning gun with your Mac/PC and scan barcodes to add items to an order; making the rental and sale transactions swift. Before we begin, make sure to enable handheld scanners from Settings -> Add Ons -> Hardware Integration. 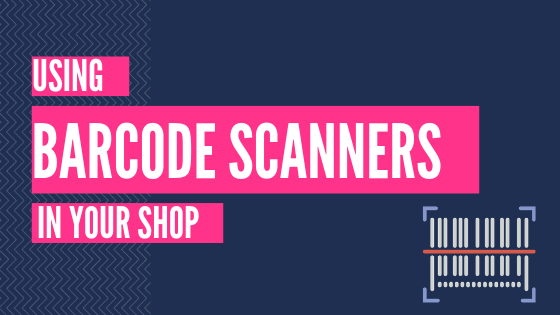 You can view a comprehensive list of recommended hardware for Barcode code scanners here. Barcodes for items can be specified by storing the value in the ‘Identification Number’ field. 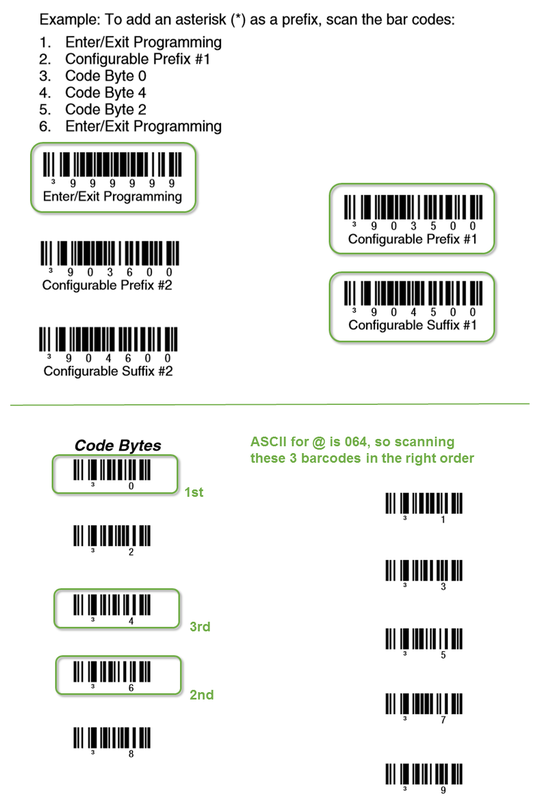 A barcode is a sequence of alphabets, numbers and dashes (-) e.g. ABC-123aa-9878. a) Already have Barcodes on your items? The barcode sequence needs to be added to the Identification Number field of the item. Say a DSLR Camera (Asset #5) in your store has barcode CAM-00001. You’ll add CAM-00001 in the Identification Number field for Asset #5. These Identification Numbers can also be imported via Excel. Note: No two items can have the same Identification Number, because it has to uniquely point out to a specific item. b) Have to create Barcodes for your items? 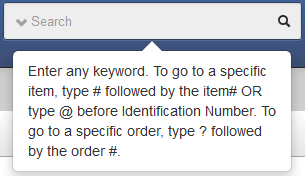 If you want to create barcodes afresh, add a unique sequence number in the ‘Identification Number’ fields. Then create a Print Label template that prints barcodes instead of QR Codes. Here are more details on label designing. The items listing can be customized to show the Identification Numbers. You can also choose to have Identification Numbers shown on Orders and Invoices (See Settings -> Company Settings -> Serial Numbers of items in orders). 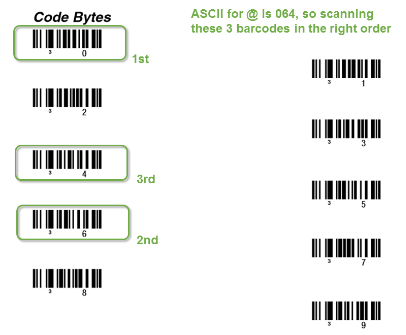 Tip: Smaller barcode sequences get scanned quicker. – The scanner should be able to connect to a Mac/PC and be HID (Human Interface Device) compliant. – EZRentOut uses Code 39 for barcode encoding (although our mobile apps support scanning multiple formats). So if you’re using barcodes generated via EZRentOut Label Designer, the barcode scanner should support/allow Code 39 type barcodes. Note: Code 39 barcode encoding allows the use of digits and characters up to 39 characters. 1) Scan the Enter/Exit Programming barcode. Now the scanner will be in programming mode. 2) Scan the Configurable Prefix #1 barcode. Now the scanner will expect the prefix (@ in our case) to be scanned. 3) From the ASCII conversion chart, you’ll see that the @ character is 064. 4) So from the Code Bytes, scan 0, then 6, and then 4 (highlighted as 1st, 2nd and 3rd in the image below). Now @ is configured as the prefix that will append every time a barcode is scanned. 5) Then scan the Configurable Suffix #1 barcode. Now the scanner will expect the suffix (@ in our case) to be scanned. 6) From the Code Bytes, scan 0, then 6, and then 4 (highlighted as 1st, 2nd and 3rd in the image below ). Now @ is configured as the suffix that will append at the end of every barcode that’s scanned. 7) Scan the Enter/Exit Programming barcode again, to exit the programming mode. Here is the excerpt from the VoyagerCG guide, that we used. While you’re on the order page, scan the barcodes and they’ll be populated in the Add Items field. If you scan barcodes with associated assets (e.g. ezrent0171, ezrent0134 and ezrent0150), you’ll see the following in the Add Items field. Scan as many labels, as you like and then hit the Add button to add all of them to the order. If you scan a barcode that’s not in you EZRentOut account, it’s shown in red. Items Verification Feature (should be enabled from Settings -> Add Ons -> Item verification for Order) also works with this set up. From an Order’s detail page, click ‘Verify by Scanning’ button and on the overlay start scanning items. Once you’re done scanning, hit ‘Verify’. You can also scan item labels to add items to a drafted order using EZRentOut’s mobile app. The app uses your phone’s camera to scan barcodes/QR Codes of rental and sale items. In addition to that, you can scan the QR Code on an invoice to pull up an order and take actions. You can also scan to add items to an order (drafted only) using the mobile app. Order Items Verification feature also works perfectly on the mobile app. Log into your account to try this out and let us know what you think about it at support@ezrentout.com. You can log in your feedback on our User Community Forum or join in the conversation on our Facebook Page. This entry was posted in [Support], barcode KB and tagged Point of Sale by admin. Bookmark the permalink.